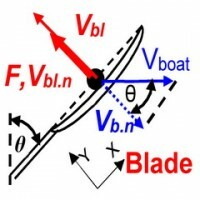 where Vbl is the normal blade velocity relative to the boat (derived from measured angular velocity and actual outboard), Vboat is the measured boat velocity, θ is the measured oar angle. 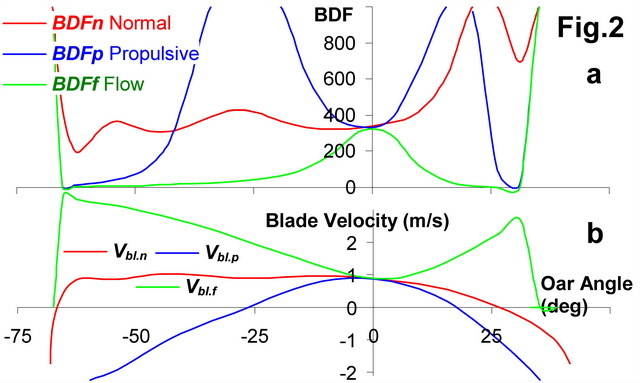 where Fbl is the normal blade force (derived from the measured handle force and actual gearing ratio). Fig.2,a shows all three drag factors above in M1x at 34.5spm (the sum of two blades) together with corresponding blade velocities (b). As it should be, all three BDFs are nearly equal at the 0 deg. oar angle at about 350, when the normal blade velocity is 100% propulsive (directed parallel to the boat) and water flow velocity is normal to the blade, so is equal to the blade velocity. •	BDFn is the most consistent from the catch to the 0 deg. oar angle, then it increases to infinity at about the 25 deg. oar angle, when blade velocity Vbl.n crosses zero. After this point it decreases down to zero, while blade force decreases and blade velocity increases, but in the opposite direction: forward with the boat, towards the bow. •	BDFp goes to infinity twice during the drive, at -25 and 20 deg., when Vbl.p crosses zero from negative (towards bow) to positive (towards stern) and back to negative. After the catch and before the finish it is close to zero because the blade force is low, but the blade centre moves fast with the boat. •	BDFf is low at the beginning and the end of the drive, because the velocity of the water flow is high at sharp angles of attack, but the force in this direction is low. It never goes to infinity and its curve has a smooth bell shape. It is interesting to compare the blade DF with the boat DF, which was 2.95 in this case. So, the blade DF was about 120 times higher than boat DF, and this is is the only reason why the rower-boat system is able to move through the water.